Successful 2017 Annual General Meeting of the GSU. 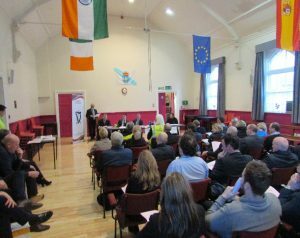 The Executive Committee of the Guinness Staff Union was delighted with the packed Parochial Hall in James Street where the 48th Annual General Meeting of the Union was held on Wednesday 8th March. The AGM gets under way and yes that seat was taken as the room filled up! 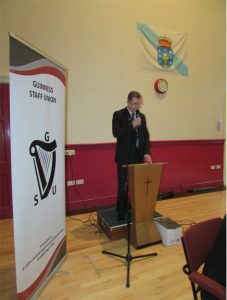 A very comprehensive report was Given by the General Secretary John Dunne who expressed his thanks to all members of the Union who had welcomed him to the position of General Secretary following the retirement of Sean Mackell from the position after 23 years’ sterling service to the Union. Johns report covered the pay agreements reached for members employed under the TRF agreement and also our members in the Guinness Storehouse. He also touched on the many challenges facing the Union and the importance of recruitment for the future of the Union. The GSU has the biggest membership of organised members in Diageo Ireland and is one of the biggest Unions per capita in Diageo Europe .The AGM also agreed to a rule change proposed by members of the Brewing and Engineers Branch and supported by the Unions Executive. 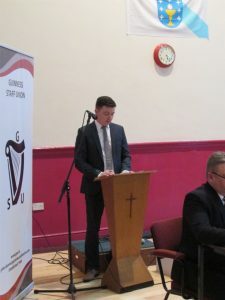 The meeting was Chaired by Alan McCabe who paid tribute to deceased members and friends and particularly GSU member Susan O’rawe who died suddenly in February this year. The Financial report was given by Stephen Stafford Hon. Treasurer of The Union. John Dunne General Secretary delivers the 2017 Annual Report to the AGM. 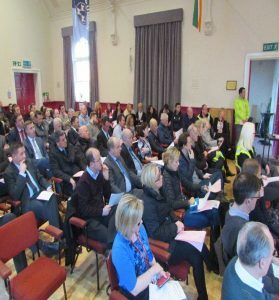 The GSU would like to thank the staff at the Parochial Hall in James Street for facilitating such a large attendance .